This is the page where I get to brag a bit. The truth is it's hard to be a journalist for any length of time and not be an "award winning" journalist. I have, however, won a few of which I am particularly proud. I've highlighted some of the recent ones here so you'll know how special I am. Jay Evensen was named the 2011 recipient of the Cameron Duncan Media Award, presented at the annual RESULTS Educational Fund International Conference in Washington, DC. The award is presented every year to a journalist who has demonstrated outstanding reporting of issues related to poverty and hunger. RESULTS is a leading advocate for microfinance as a way to help the extremely poor people of the world find a way out of poverty. The developer of microfinance, Muhammad Yunus, was awarded the Nobel Peace Prize in 2006. A letter sent to Evensen, said, "After an internal survey of coverage of domestic and global health and poverty over the past year, we determined that your writing on this critical issue stood out as particularly outstanding." The Utah chapter of the Society of Professional Journalists awarded first place and honorable mention in its "opinion column" category to Jay Evensen of the Deseret news. The two awards equal half the honors given in that category. The first-place award was for a column titled, "Warren Jeffs a monster, but popular culture not much better." The column, published Aug. 11, 2011, argued that FLDS Church leader Warren Jeffs deserved to be convicted of charges related to sexually abusing young girls, but that popular culture, through its themes, photographs and dialogs, does much the same thing without censure. The judges said, "The author’s focus is consistently intact…makes his point, does it with good, clean writing that carries the reader’s interest from one graph to another." The honorable mention award was for a column titled, "It's now time for Occupiers to hit the road." In it, Evensen recounted his visit with Occupy Salt Lake protesters. He concluded, "It's time for occupiers to pull up stakes and get involved politically to see if their message resonates. My guess is it doesn't." Both honors were awarded June 15. Jay Evensen was awarded second place in the inaugural In Character Prize in 2006. He was recognized for his column, "Forgiveness has power to change future," published Aug. 21, 2005. The award, which honors the editorial treatment of human virtue and its importance in the life of our society and country, is sponsored by In Character magazine, published by The John Templeton Foundation. "Jay Evensen writes a consistently informative and provocative column," said John Hughes, editor of the Deseret Morning News. "Interestingly, this column on making the world a better place had been cited by (LDS Church) President (Gordon B.) Hinckley at a conference session mentioning the Deseret Morning News and Jay by name." Evensen's column mentioned Victoria Ruvolo, 44, who had a frozen turkey thrown through her front windshield. She endured many hours of surgery and then learned about the background of her 19-year-old assailant, Ryan Cushing, before insisting prosecutors offer him a plea deal. Ruvolo and Cushing embraced in the courtroom after he apologized to her. She then urged him to make something of his life. "Humans seem to be learning to understand the power of forgiveness," Evensen wrote. "As a healing agent, it appears to be stronger than any surgery, counseling or anger-management course." The Utah chapter of the Society of Professional Journalists awarded both first and second place to Jay Evensen in the "opinion column" category for large newspapers in its 2013 contest. 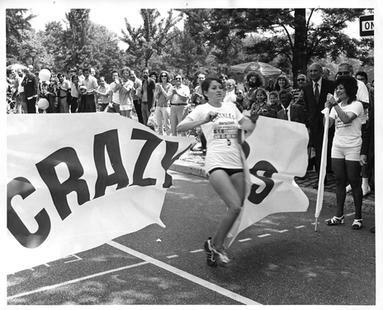 Evensen was cited for his column about Jacki Marsh, the first winner of an all-female race in New York City in 1972. Jacki Marsh crossing the finish line. Evensen's second-place award was for a column about the relationship between summer wildfires in Utah and stupidity. The column focused on Gov. Gary Herbert's remark that the state "can't pass a law that outlaws stupid." "That doesn't mean, however, that the rest of us have a corner on intelligence," Evensen wrote. The Top of the Rockies contest, which recognizes the best in the journalism in the Rocky Mountain area, awarded Jay Evensen third place for column writing in 2012, based on work published in 2011. The following three columns were recognized. To read them, click on the headlines. Evensen won second place in the same contest in 2011. The following three columns were recognized. What would you have done in Bennett's place? The Top of the Rockies contest in Denver awarded Jay Evensen third place in the personal/humor column category in its 2013 results. The award was announced May 17 at the Denver Press Club. The contest, sponsored by the Colorado chapter of the Society of Professional Journalists, received more than 700 entries from news outlets in Wyoming, Utah, New Mexico and Colorado. Evensen began writing the weekly column, which takes a lighthearted look at current events, in 2011.